So let’s take a closer look at the MIDI-1001 and see just how it works! First, you’ll notice the MIDI-1001 system consists of two MIDI-1001 transceivers each with “MIDI IN” and “Out” Ports. These are for connection to your MIDI equipment (keyboard, sequencer) and essentially act as “MIDI to CAT5” interfaces. They allow you to transmit and receive MIDI information over CAT5 cable. Why do we want to do this? Well if you don’t remember it’s so you can extend MIDI signals past 50 ft and up to 1000 ft, something not possible over standard MIDI cables. So let’s say you want to “MIDI” two devices like a keyboard and a sequencer, here’s what you do! 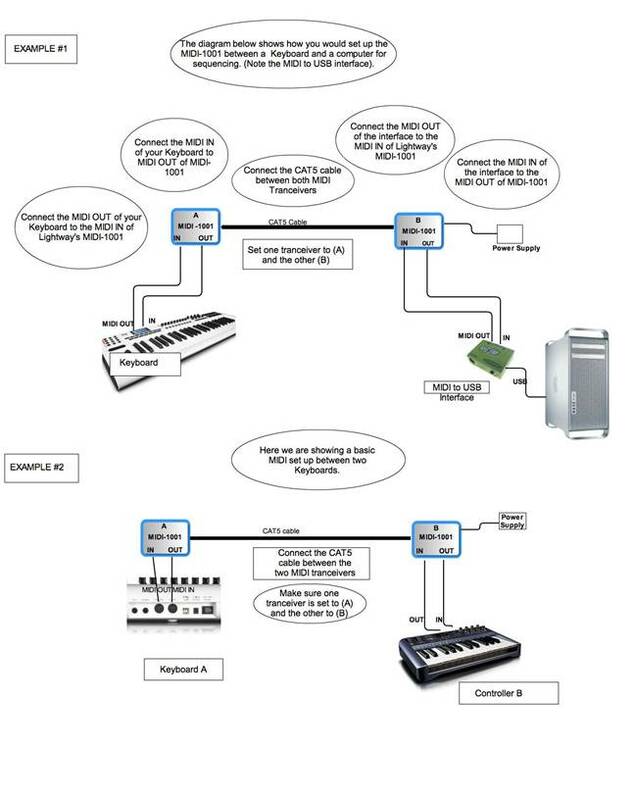 Basically it’s very simple, you’ll need to connect each MIDI-1001 transceiver to each MIDI device (keyboard, sequencer) via standard MIDI cables. Note: You must connect the “MIDI OUT” of your equipment to the “MIDI IN” of MIDI-1001. After they are connected via MIDI to your keyboard and sequencer they are then joined by the CAT5 cable. Note: Before jumping ahead as I know you are excited to test out the MIDI-1001 system there are a few minor steps to take before hand. So please see a step-by-step installation procedure below. 1) Set the MIDI-1001 transceivers to A and B using the DIP switches on the front panel of each unit. (Set one unit to A and the other to B). 2) Connect power to the MIDI-1001 units. 3) Connect the Cat 5 cable between the two units. 5) That’s it! The units are now set up. The unit is designed to operate in simplex, full duplex or drop-and-repeat modes. Below are a few extra setup diagrams.